What Does the Wisconsin Recall Mean for November? 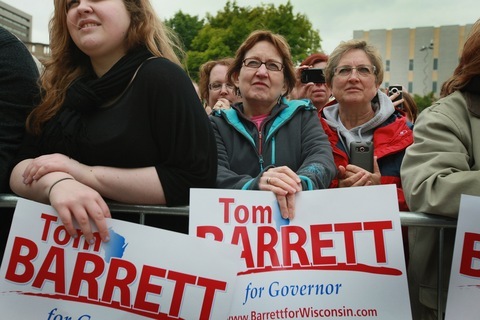 Supporters of Milwaukee Mayor Tom Barrett, who is trying to unseat Wisconsin Gov. Scott Walker, attend a rally on Friday. Photo by Scott Olson/Getty Images. In a year when most analysts are expecting a close presidential election, nearly everyone is also looking for a way to figure how the vote will break. That’s why there has been so much chatter about Tueday’s gubernatorial recall election in Wisconsin. The vote is being framed as a test of Republican strength in a swing state, a last stand for unions, a chance to see where the electorate is five months before November and a reflection of the power of conservative-donor spending. In truth, the Wisconsin recall vote is probably none of those things. It’s a single vote in a highly unusual situation held at an odd time far enough in advance of the presidential election that it’s hard to see any broader significance. Add in the overwhelming spending advantage for supporters of GOP Gov. Scott Walker and the larger meaning becomes even harder to see. It’s not that all that money doesn’t matter, but does anyone expect Republicans to have a 2-1 spending advantage in the fall? Still, there are some numbers and measures worth looking at in Tuesday’s vote — particularly as seen through Patchwork Nation’s geographic and demographic breakdown of counties. WHAT DOES TURNOUT LOOK LIKE? On the statewide scale, turnout may be the biggest question. When you look at the numbers for Wisconsin in 2008 and 2010 — or for most states — it looks like the results were less about a swinging electorate than they were about a different electorate. The total presidential election vote count in the state for 2008 was 2.9 million — about 1.7 million for President Obama and about 1.2 million for Sen. John McCain. The total vote tally for the 2010 gubernatorial race was about 2.1 million — 1.1 million for Walker and 1 million for Milwaukee Mayor Tom Barrett. Turnout was down substantially in Milwaukee County, home to Barrett’s city, by about 120,000 votes. So does turnout on Tuesday look like 2008, 2010 or something else? Some experts are predicting the numbers will feel, well, more presidential — up near 2.7 million. But special elections are notoriously hard to predict, and it could be that an additional vote in early June after weeks of negative campaigning will leave voters feeling cold. Regardless, the higher the turnout number, the louder the claims of the winning candidate will be. WHAT’S HAPPENING IN THE ‘BURBS? There are nine largely suburban Monied ‘Burb counties in Wisconsin, but they hold a lot of votes. In both 2008 and 2010, they contributed more votes than any other kind of county. Wisconsin and the GOP made very big gains there in Walker’s 2010 win. Wisconsin’s Monied ‘Burbs (in beige on the map above) tend to be more conservative than those counties nationwide. McCain lost the ‘Burbs nationally in 2008, but he won them in Wisconsin by about 6 percentage points (or about 40,000 votes). Walker, however, won them by a massive 17-point margin (some 145,000 votes). He won the whole state by 124,000 votes. The ‘Burbs may also be some of the places least offended by Walker’s moves to trim the power of public sector unions, as we have noted in other reporting. The people living in the ‘Burbs tend be better off. They proportionally have more private sector employees and might be more open to the idea that public sector workers should have to feel the pain of tighter budgets. Keep an eye on the vote coming from those nine beige counties Tuesday to see if the 2010 Walker trend holds or if things look more like 2008. WHAT ABOUT EMPTYING NESTS AND SERVICE WORKER CENTERS? One the flip side of the ‘Burbs are the aging Emptying Nests and the small-town Service Worker Centers. President Obama won both county types in Wisconsin in 2008, but Walker won them by large margins in 2010. There is reason to believe they may be tougher for Walker on Tuesday. These communities tend to have lower populations, and their economies are more reliant on public sector workers. In other words, cutting the bargaining power of the local highway crew or of the teachers at the local high school may have an outsized impact in these 53 counties (in light green and red on the map above). We saw that in 2011 when incumbent and Walker-ally David Prosser nearly lost in a vote on Wisconsin Supreme Court judges. Wisconsin’s incumbent Supreme Court judges generally walk to victory. The map below shows how the counties voted in that election compared to 2010. In the blue counties, Democrats outperformed their percentages from the state’s 2010 gubernatorial race. There is a lot of blue scattered across the state in the Emptying Nests and Service Worker Centers. Add it all up and you get a different picture of Tuesday’s main event. In a sense, the real fight is not about Walker or Barrett or outside spending; it’s about the divide that presented itself recently in Wisconsin between wealthy suburbanites and struggling rural locales. Were the results of those recent elections aberrations, or is something bigger going on? The answer to that question may have resonance long after Tuesday’s vote. But whatever happens, the vote is one election in one state with a bunch of very specific issues. The bigger question of “what does it all mean for the fall” is going to have to wait — for about five months.